The most popular curries in Thailand are simply called yellow, red and green curries – based on what colour the sauce is. Yellow curry sauces are probably the mellowest with a sweet and slightly spicy flavour. Red curry does have a kick, but not a ‘Yowza’ one. 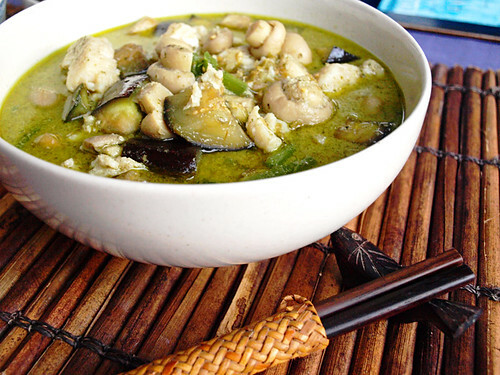 The hot totty of the colourful curries is green curry which some claim to be the hottest of Thailand’s curries. Despite green curry’s triple chilli rating, the sauce isn’t bullied by the piquancy. 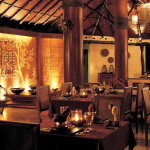 It is beautifully fragrant with an artist’s palette of flavours which makes it the sizzling jewel of Thai curries. 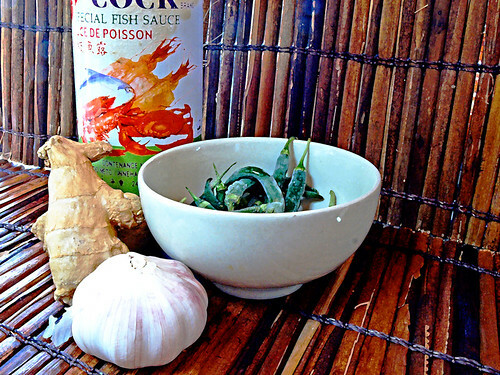 To make a good green curry, you need a feisty green curry paste. If you aren’t fortunate enough to be anywhere that sells jars of the stuff, then we might just be able to help out. 10 small hot, green chillies with stalks removed (sadist chefs imposing a truly authentic Thai green curry experience should add 5 more chillies… and laugh manically). 1. Put all the ingredients into a food processor and blend until all the ingredients combine fuse into a chunky, deep jade paste. 2. Place the paste in a sealed container and keep in the refrigerator for up to 4/5 weeks. 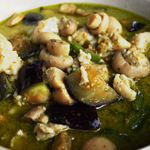 Try our ‘yum, yum… pass the water’ Thai green curry with fish recipe for the perfect foil for this curry paste with attitude. Yep that’s defintely going to be hot and volatile….pepper, chili and ginger = rocketfuel. Just remember the greener the curry the more green chili’s got added!